The footprint above is a cast of a footprint from Dinosaur State Park in Rocky Hill, Connecticut. 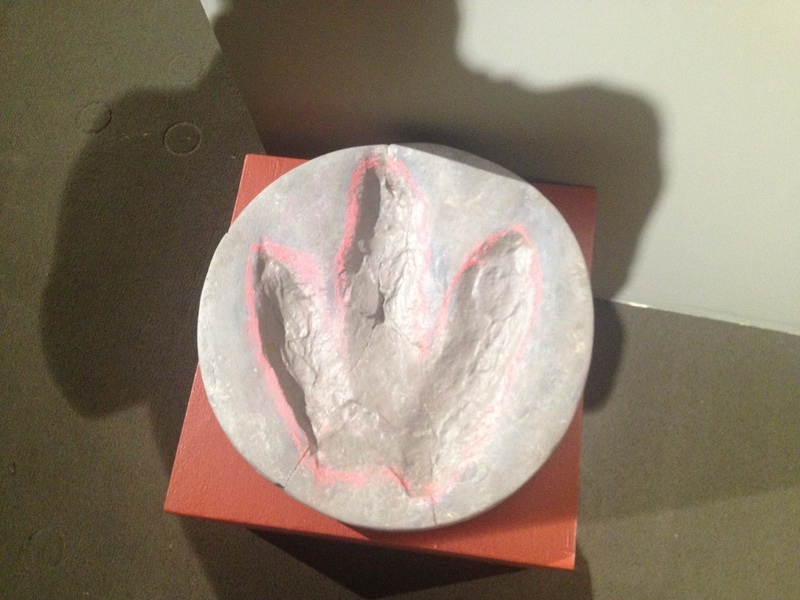 It belongs to the ichnogenus Eubrontes giganteus, which is probably the track of a Dilophosaurus wetherelli. These predators grew up to 23 feet long and weighed up to 1.3 tons. That’s one huge dilophosaurid! The tracks above belong to Podokesaurus (outlined in green), Anomoepus (outlined in purple), and Batrachopus (outlined in tan). Podokesaurus (ichnogenus is Grallator) was a small Coelophysid dinosaur that roamed the northeast around 175 million years ago, the same time as Dilophosaurus. It was a small, slender theropod dinosaur which could probably reach a maximum size of 6 feet in length and 90 pounds in weight. Anomoepus was a small ornithopod dinosaur (probably heterodontosaurid) which may have fallen prey to both Dilophosaurus and Podokesaurus. Batrachopus was a small crocodyliomorph (either a protosuchian or an aetosaur, as I depicted it) which scurried around the Connecticut river valley at the same time as the dinosaurs I mentioned above. The Corythosaurus casuarius partial leg exhibited is that of a juvenile, which was previously known as “Prochenisaurus“.The Placenticeras meeki exhibited lived in the Western Interior Seaway alongside Tylosaurus proriger. Some fish from the green river formation. The large fish(Mioplosus labracoides) had not been examined since Leidy first described it! The other two fish are Priscacara liops and Knightia alta. 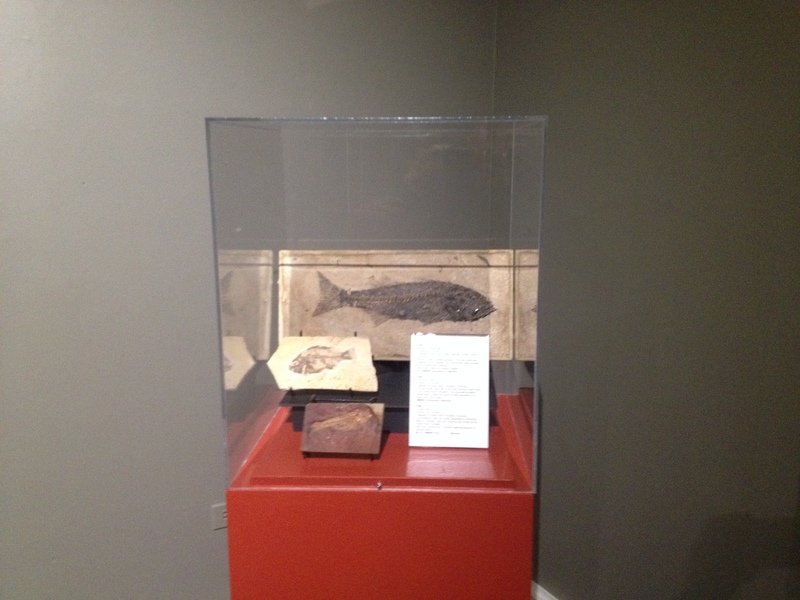 Some fossils which I prepared for the exhibit, such as the Mioplosus pictured above, may have not been seen by human eyes since they were gifted to the museum! In fact, when me and the curator of collections pulled the crate the fish was stored in off the collection shelf, I believe saw Leidy’s signature on a paper associated with one fossil. The Knightia, as well as some other fish, had the signature of Othniel Charles Marsh written on the item description on the back of the fossil! 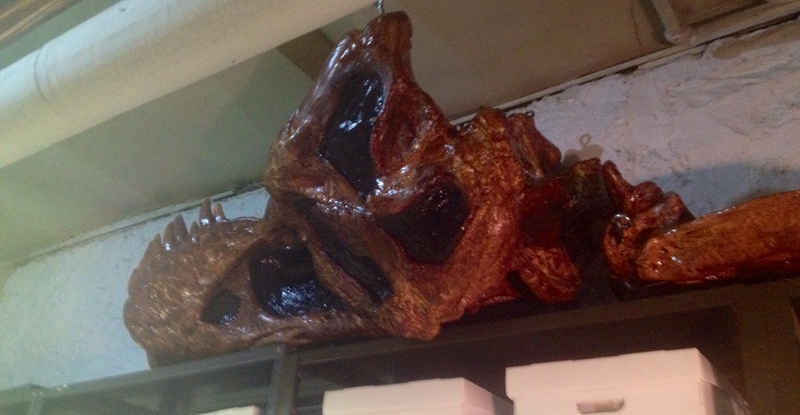 These are some real cool specimens if you are interested in the history of paleontology as a science. 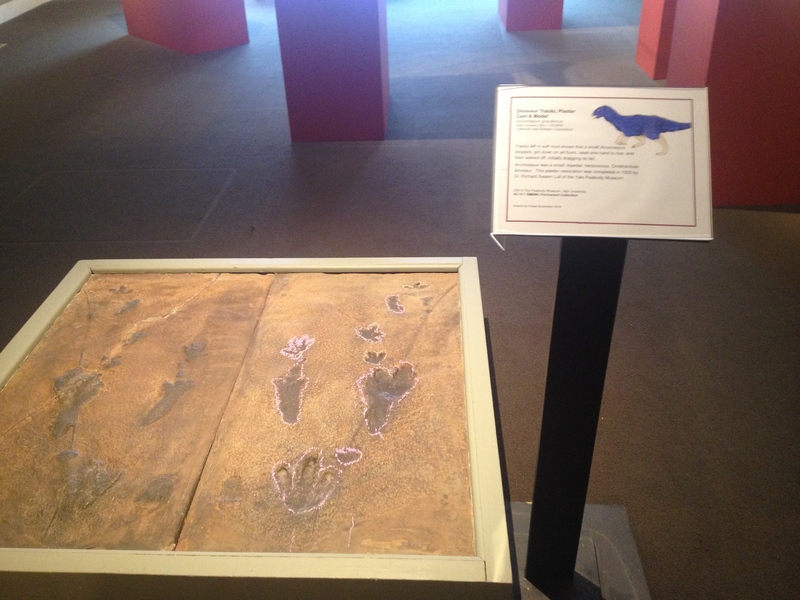 These fossil footprints were made by an Anomoepus who decided to take a rest. If you enlarge the image, you can clearly see the mark made by the back of the pelvis as well as the tail imprint, which is represented by a small patch of discolored mudstone. 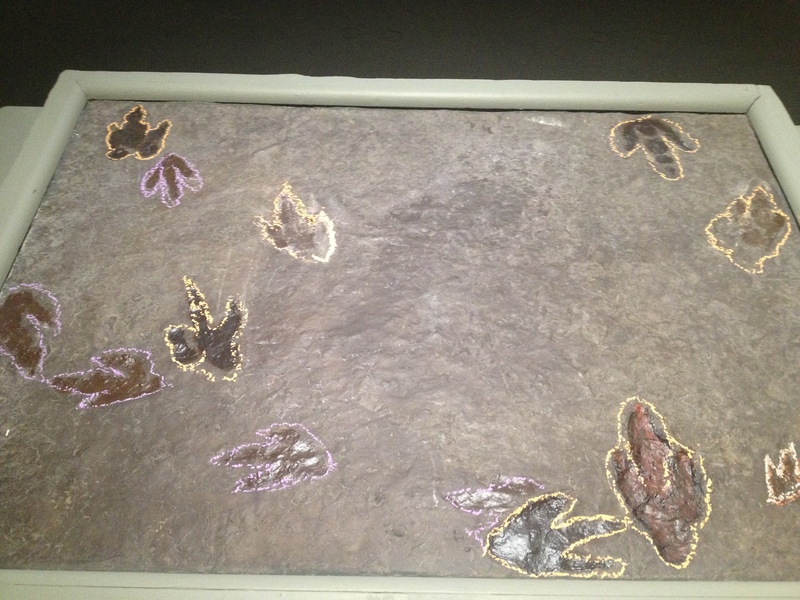 Batrachopus also makes an appearance in the upper right corner of the slab. Overall, it was a ton fun prepping the fossils and creating the illustrations which would accompany them in the actual exhibit. 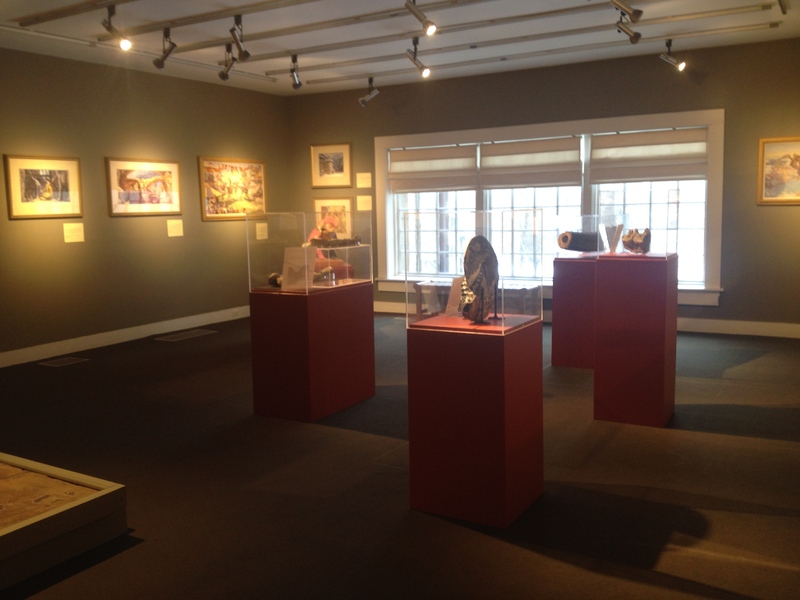 Remember, If you are in the Stamford CT area, consider checking out the exhibit at the Stamford Museum. And thanks for reading!! 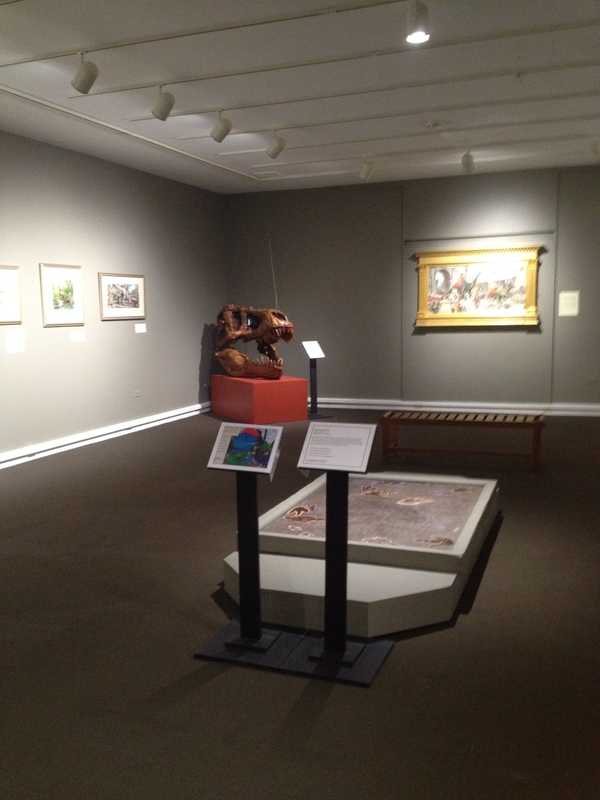 Dinotopia: The Fantastical art of James Gurney opens! We decided to name our skull cast Mr T! The curator of collections came up with that one, so if you don’t like the name, don’t take out your anger on me (I’m just kidding)! If you are in the Stamford CT area, please come over and view the exhibit! The pictures here were taken before the hall was opened as I want to respect people’s privacy. Thank you for your understanding (I also wanted to get good pictures for you guys). Hi guys! Just a quick post here! 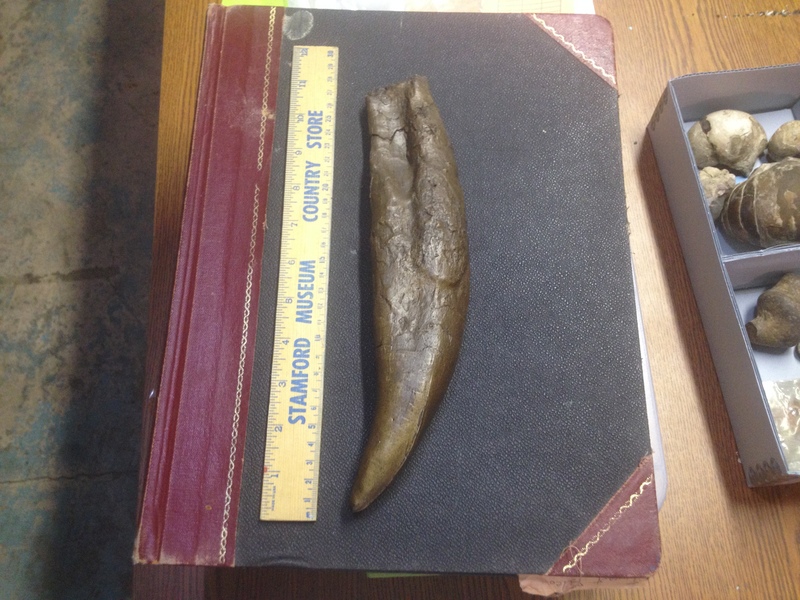 As you may know from previous posts on this blog, I have been working with the Stamford Museum and Nature Center to revamp their fossil collection. I also have the amazing duty of being the resident paleontologist. 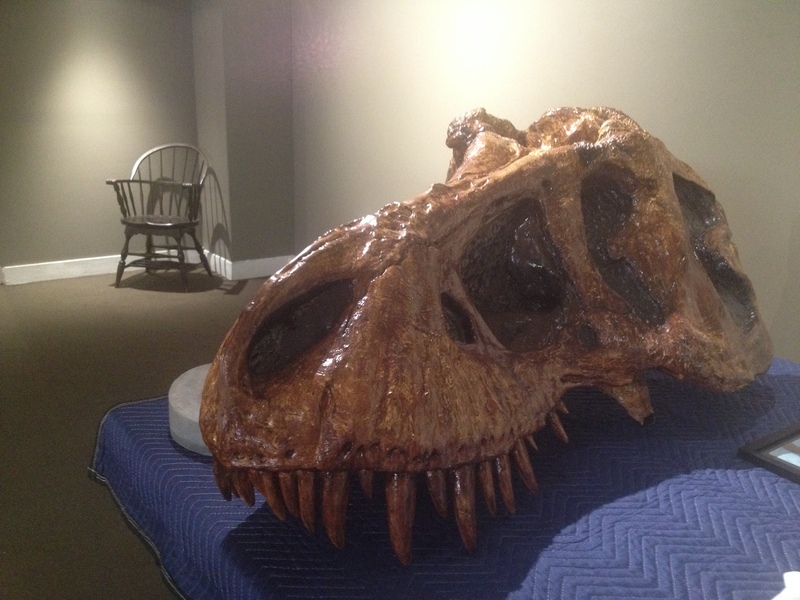 This spring, from February 14 to May 25, the museum will showcase some pieces from its fossil collection alongside the work of the artist James Gurney. So if you are in the Stamford CT area, please visit and enjoy the exhibit! I will post updates on this project to keep you all informed. 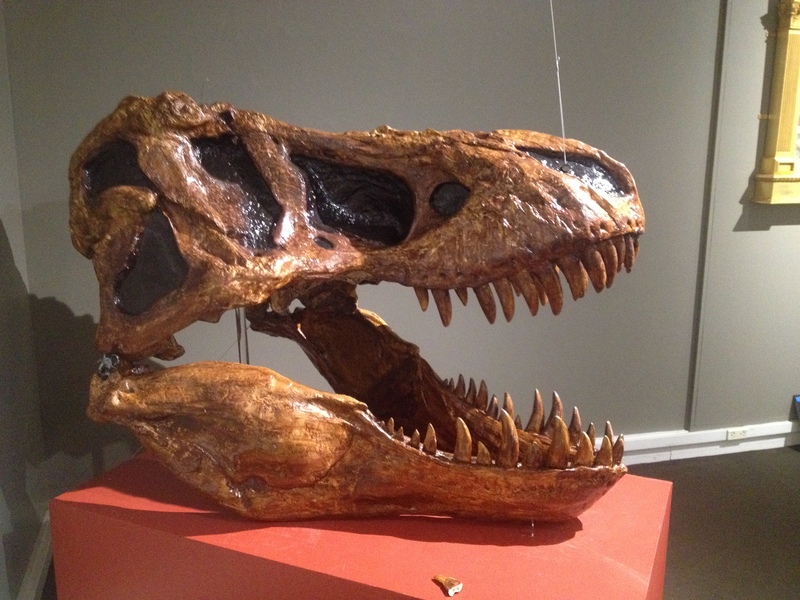 Thanks for reading, and this week’s Paleonews will be posted either tomorrow or Wednesday. 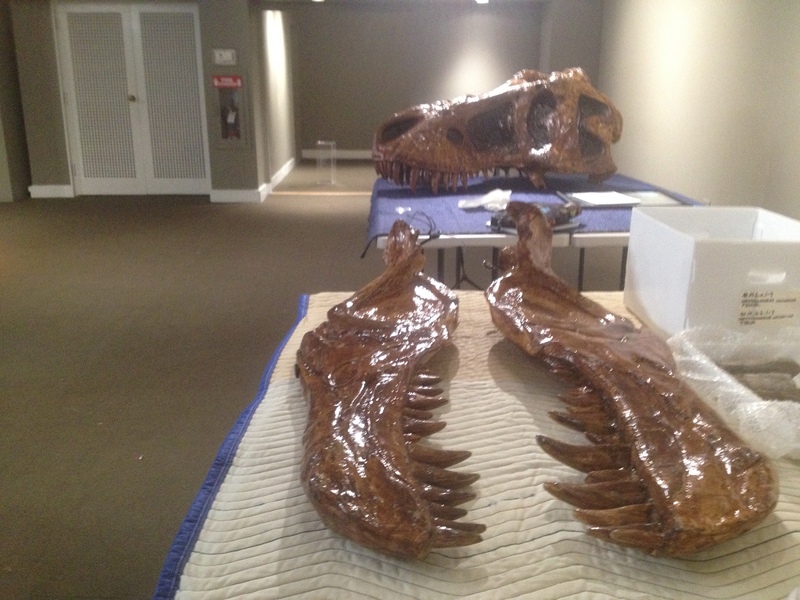 Recently, I have had the honor of working with The Stamford Museum in prepping their fossils for an upcoming exhibit featuring the art of James Gurney (you should really check this guy out!!). 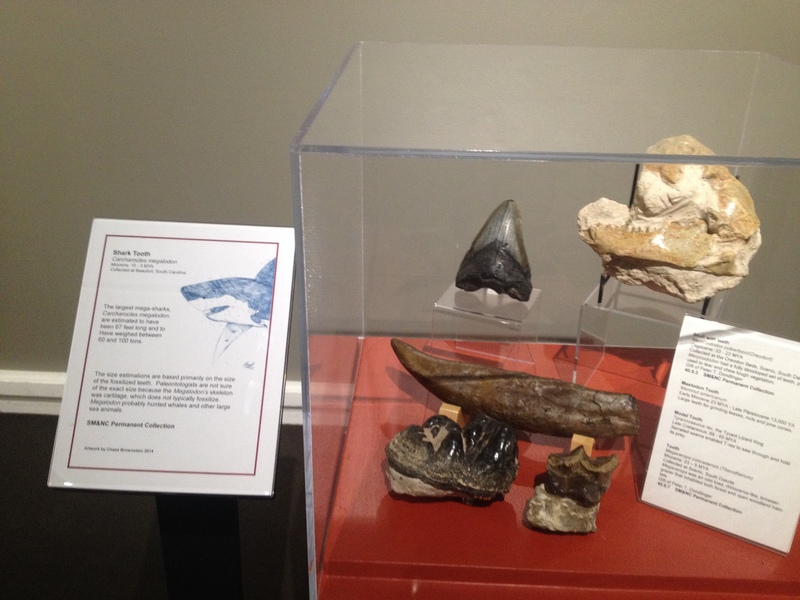 Being in CT, the museum has acquired a vast collection of local fossils (Connecticut river valley specimens, etc. ), and the curator has commissioned me to create murals of the animals in their collections. Right now I am working on the Triassic CT mural, which showcases a Dilophosaurus (Eubrontes giganteus), two Anomoepus (heterodontosaurid tracks, maybe? ), a prosauropod dinosaur (presumably Ammosaurus or a close relative), Podokesaurus, and a phytosaur. What is awesome about this project is that I get to work with fossils which were excavated ages ago. I mean, some of this stuff has not been relabeled since the time of Leidy or Marsh. Crazy! Some of the specimens they have were even by Leidy and Marsh themselves (according to the labeling)! As a self-proclaimed paleo-nerd, that just blows my mind!! Anyways, I hope everyone had a great holiday season and I will be back with more later! Thanks for reading!